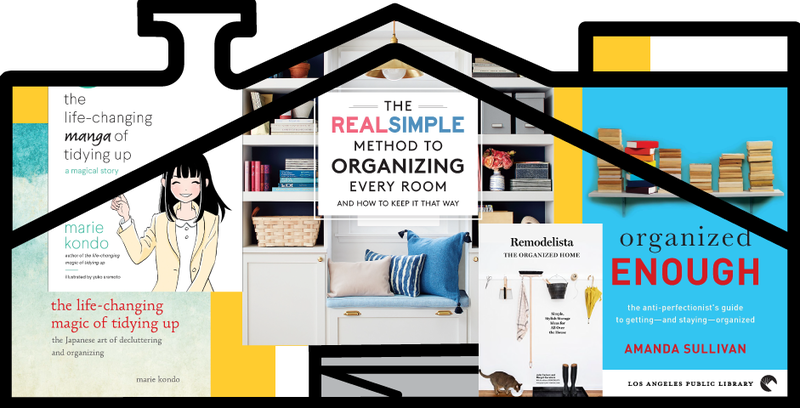 Start 2019 by organizing your home and your life. If you do not know how to start, the Los Angeles Public Library has many books that can help you. For example, we have books written by the famous organizer guru Marie Kondo who has motivated millions of people to organize their home and life with her KonMari method. Her first book, The Life-Changing Magic of Tidying Up: The Japanese Art of Decluttering and Organizing, was a best seller and has been translated into more than 30 languages. The KonMari method is so popular that in January of this year Marie Kondo started her own television series on Netflix where she helps people organize and live with fewer objects in their homes. Get rid of all the things that you do not use and just leave what makes you happy. For example, if you have a pair of shoes that you have not worn in the last two years, it is time to get rid of those shoes. You can donate them or give them to someone who will use them! Start organizing by category. For example, you can dedicate one day to organize your clothes. Start with small steps. Part of being organized is knowing the methods of how to keep things in order. For example, with the KonMari method, you will learn the best way to fold your clothes, organize your papers, etc. Create spaces for each object you have. To maintain order you have to make sure that you have assigned places for all your objects. For example, dirty clothes that are colored go in one bag and dirty clothes that are white go in another bag. Create routines that will help you to always maintain an organized home. Remember that organization will make it easy for you to keep your house clean and as a result, you will have more time to do things that make you happy.